The church keeps the first Sunday in October to mark its dedication in 1321. The programme to reflect this occasion will include Brahms How Lovely is Thy Dwelling Place, Harris, Bruckner and especially Parry’s great anthem ‘I Was Glad When They Said Unto Me. Sunday tea to follow (extra charge). 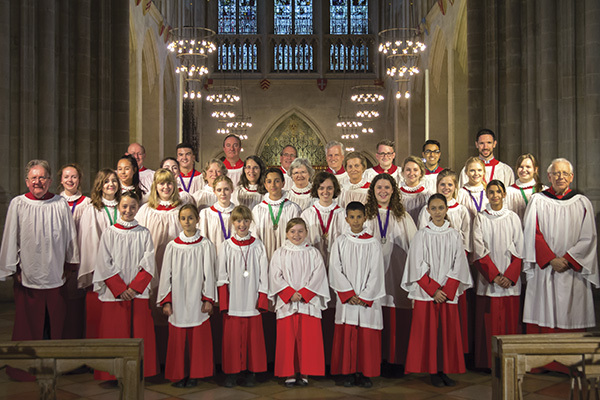 Pinner Parish Church Choir is a voluntary group of people who sing regularly, mostly twice a Sunday at the Sung Eucharist and Evensong services. The ages of the group range from 7 to over 70, male and female and nowadays, most unusually for the London Area, the top line (Soprano/treble) is sung by youngsters up to the age of 18. Often these teenagers get so interested in their singing that they continue it at university as choral scholars; sometimes it becomes a lifelong interest, but for some it becomes a career. Currently there are 6 past choristers at Birmingham, Manchester, and Cambridge doing just this. When they started singing here they had no idea of Church Music, but, they caught the bug and took their interest into adult life. Such is the power of belonging to our church choir! Do please take one, or several of our recruiting leaflets to talk about and ultimately, give to your friends/relatives/neighbours – encourage them to go to the choir section of the church website and listen to the choir singing.